Hollande's approval ratings are poor and he faces an uphill fight in an election next year. He might not get the opportunity to make the sort of philosophical stance against American policy that fomented last decade's mini boycott. But it's something to keep in mind if your business is dependent on French wine. Other countries seem less likely to incur Red State wrath, but don't count it out. What if Trump decides he wants to park nuclear subs in New Zealand? Foreign leaders right now are deciding how much to swallow; the wine industry will not play a part in their calculations, but fortunes depend on their decision, and they know it: check out the congratulatory speeches that roll in today. If someone like Australia's prime minister Malcolm Turnbull later decides to take a principled stance against Trump, Australian wine exports here will suffer. We're not going to stop buying cheap imported wine, and we're not likely to get into philosophical or trade wars with Chile. Cheap foreign wine might even make a comeback, because, after about five years of wine moving steadily into the luxury realm, we might be going back downscale. You have to be a real optimist to think Trump's election is not going to lead to an economic downturn. People won't stop drinking wine, but they will drink cheaper wine. Remember the wine market of 2008-09? Luxury wines gathered dust on shelves and wineries had to retool to sell wines in the $20 range. That said, Trump and the Republican Congress are likely to push through huge tax cuts for the wealthiest Americans -- the people who buy luxury wines. And though he doesn't drink, Trump's core business ideas tend to be about luxury: hotels that flaunt conspicuous consumption. We're not likely to see an immediate populist backlash against wine spending as long as it's domestic. So Napa Valley probably comes out of this OK. If I were selling a $75 Pinot Noir from anywhere outside Napa Valley, though, I'd be worried. We might see an austerity on the part of left-leaning consumers as part of general unease and revulsion against conspicuous consumption. And let's conclude back on the significance of Trump Winery. U.S. wine regulations favor large distributors, who have money to spend on state legislatures. Small wine producers have thrived in the last few years by finding other ways to get their wines to consumers, especially by direct shipping, which is much easier now than a decade ago. Large distributors will be looking to cut back on market access for wineries, and they will have a lot of legal targets, most of them at the state level as always. Trump is not noted for his attention span. The wine industry needs to make the case to him early and often that what's good for Trump Winery is good for America. 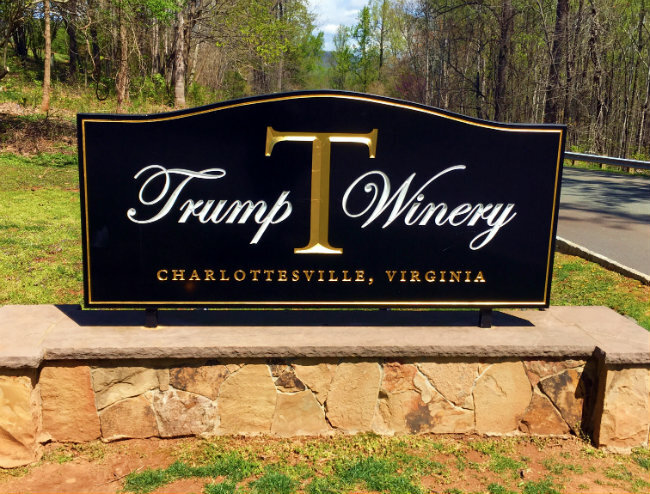 For correctness, Trump Winery is owned and operated by Eric Trump, the President-elect's youngest son. I don't share your pessimism since we have no idea what the general economy will be going over the next 4 years. Once the initial shock wore off, the stock market not only recovered but hit a new high. Given Trump's business background we might expect expansion of the economy and not necessarily a recession. Let's come back together, enjoy some good wine and not worry about predicting the future until at least early next year. Tim: I hope you're right. There's no doubt that Trump will be pro-business but both Bushes were pro-business also and we saw how that worked out. But I do hope you're right.